An introduction to some resources that can help navigate the wide ocean of stories that make up India’s mythological past. Internet Sacred Text Archive: Hinduism This is a fascinating site; go for the Vedas and Upanishads, stay for everything else from African religions to Christianity to Freemasonry to, well you name it, all the way to Zoroastrianism. Jaya: An Illustrated Retelling of the Mahabharata. The great Indian epic is ten times as long as the Iliad and the Odyssey combined. Pattanaik brings his version in at slightly less than 400 pages. I first bought it on Kindle, but the illustrations (the author is the artist) are so intriguing I purchased a print version, too. Each action-packed chapter is followed by notes on history, mythology, and character guides. Sita: An Illustrated Retelling of the Ramayana. The most wronged epic heroine ever gets her say. Kidnaped by Ravanna, the powerful demon king and great lover, she manages to resist his advances while her husband Prince Ram tries to rescue her and takes his sweet time about it. When Ram finally succeeds in defeating Ravanna and brings her back to his kingdom, rumor has it Sita really did sleep with the demon. So Rama kicks her out of the kingdom for the sake of his family name. She retires to the forest with her sons. But in the end, this return to nature sets her free. Just as in Jaya, Pattanaik follows each chapter with historical notes and discussions and includes wonderful illustrations. 7 Secrets of the Goddess. Spoiler alert: I’m going to tell you all the secrets right now. Gaia’s secret: male anxiety is outdated. Kali’s secret: nature is indifferent. Gauri’s secret: culture is dependent on human gaze. Durga’s secret: everyone lives on the edge in fear. Lakshmi’s secret: wealth can liberate. Sarasvati’s secret: imagination can expand or contract the mind. Vitthai’s secret: affection dissolves boundaries.Wait, Vitthai? I’d never heard of her either, but wait till you read her story. Interesting and enlightening discussions of the Devi in all her forms. Shikhandi and Other Tales They Don’t Tell You. There’s nothing new under the son. Issues in gender identity go back thousands of years. Pattanaik discusses many Indian tales as well as comparable myths and folktales from other cultures. A must read for its look at queerness in India’s mythology. Doniger’s erudite, witty, and thought-provoking book clearly shows how this quote applies to the Indians themselves, who tell one story in many ways, affected by regional culture or the worship of a particular god over another or simply the way a local storyteller might embellish the tale with his own imagination. The quote can also mean the way someone from another culture will tell the tales, for example, the way Calasso interprets them in his book, Ka (see below) or the way the Buddha’s life is retold in Southeast Asian Jataka tales or the way Buddhist thought was adopted and developed in China and Japan. One focus of Doniger’s book is on those other than Brahmanical males who contributed to the development of Hinduism: women, outcastes, non-Hindus (Buddhists and Jains, for example.) The first three hundred pages discuss different views of the long history that led up to the Buddha’s time and slightly beyond, and as such as been a great resource in writing the Sadhana trilogy. Calasso transforms essential stories from Indian mythology into fascinating, mysterious, and thought-provoking literature. Scholarly translations of ancient Indian scripture of necessity can be somewhat dry. The ancient poetry and stories get buried in details of ritual and repetitve verses. Calasso captures the beauty, vibrant sexuality, violence of these sacred stories. The creation myth cycle, the lives of Krishna and the Buddha, and the courtship of Shiva and and his blue goddess Parvati, are told in a style that might be called ‘mythical realism,’ a style which frees the myths from literal retelling and adds its own magic. A Cliff Notes version, but worth a read. William Buck’s vastly shortened version sticks to the main storyline, which eliminates hundreds of pages of philosophical digression and tenuously linked stories that fill the original epic. It’s not a bad way to make the acquaintance of everybody before thinking how well you really want to know them. This version’s strength lies in its overview of the complex lineage of its heroes and villains, which gives rise to the power struggles and sets the stage for the whole war. Like Buck’s version, it admirably shortens the epic to the essential story line. Another good way to get an overview of the epic. Whence this creation has arisen – perhaps it formed itself, or perhaps it did not – the one who looks down on it, in highest heaven, only he knows – or perhaps he does not know. 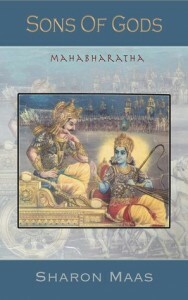 A good range of stories include the debate between the famous sage Yajnavalka and eight Brahmins, and the only one who comes close to confounding him is the feisty wise woman Gargi; the beautiful tale of the youth Nachiketas, a kind of Indian twist on the story of Abraham and Isaac; stories of warriors trying to be priests and priests trying to be warriors.